Rebooting fixes problems because it resets everything. Your network connection might be acting up or have timed out, and rebooting restores it. Rebooting also fixes problems due to brownouts or those notorious AC power flickerings that you notice occassionally, which can even affect a laptop running on an AC adapter. Such interruptions might not bother you, but they can play tricks on your laptop that rebooting can fix. If you’re in the middle of a program, try to save all your open documents before you reboot. That might not be possible, but try to save what you can. 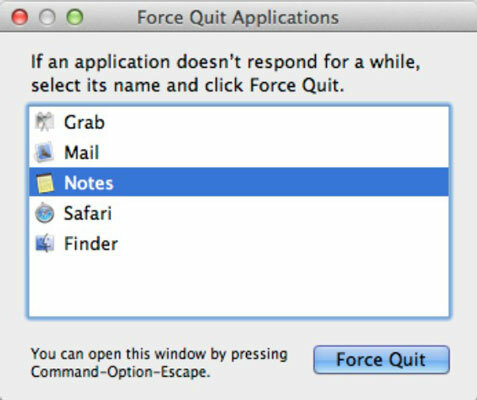 Click the Apple menu and choose Force Quit. The dialog appears on your screen. Click the offending application, and then click the Force Quit button. When you get everything to quit, you should be able to click the Apple menu and choose Shut Down (not Restart) without a problem. Press and hold your laptop’s Power button until it shuts itself off. You have to wait about five seconds for your MacBook to turn itself off. Press the Power button again to restart the computer. After everything is back up, check whether the problem is still apparent. If you use your laptop for an hour or two and the problem doesn’t reoccur, you likely fixed it!